One of my goals when moving to Quebec late last year was to make sure I continued writing RPG campaigns and dungeon mastering games. I had decided that I would get a PC and simply run games online for friends back home, and other people on the internet, but what I really wanted to do was find a local group. I had this grand campaign idea in my head that I really wanted to write and play, so I wanted a group of friends that I could sit around a table and run it for. Luckily, working in the games industry means I’m usually not short of a nerd or two who wants to play in a D&D campaign. After running a successful Christmas themed one-off session for some of my new colleagues, I realized I had found a good group to play with. Storm of Death is the name of my four part epic Dungeons & Dragons campaign. It takes place in the Forgotten Realms, and sees the players travel from the sword coast, all the way to the Anauroch Desert in the east, and to realms beyond. It’s divided into four, twenty four hour chapters, each containing four parts. This format allows me to structure the sessions properly, and makes designing narrative arcs much easier. It also enables the campaign to become modular in nature, so that when I publish it online, other groups can use some or all of the modules based on their needs. The campaign is designed as a complete campaign experience, taking characters from level 1 all the way to level 20. It can, however, be used by existing groups by picking one of the chapters and playing through it as a self contained adventure arc. I started the campaign on the 7th February, and we’ll be playing bi-weekly. 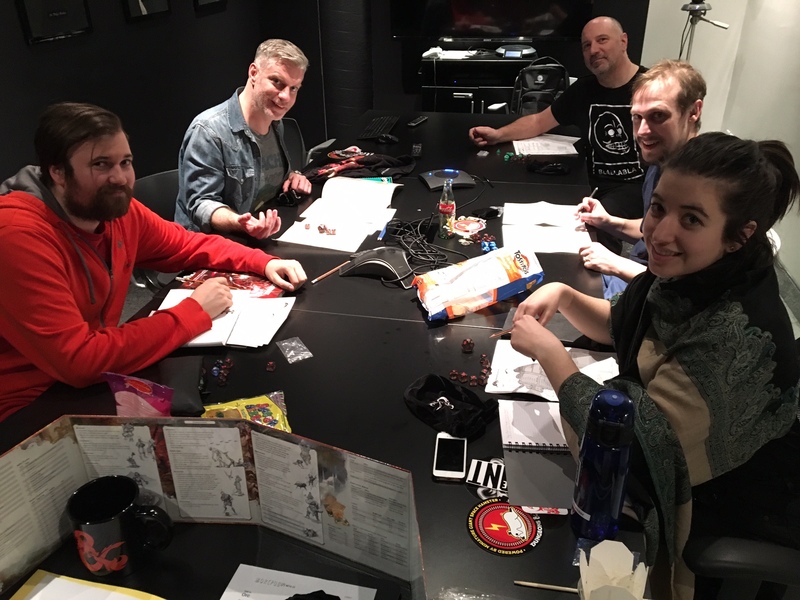 I decided I wanted to record the play through on my blog so people can follow along, or see how my group played through it. First off I want to give a big shout out to Greg Tito, the PR Manager for D&D for sending me a whole bunch of amazing stuff to give to my players, and to help make my campaign start off with a bang. 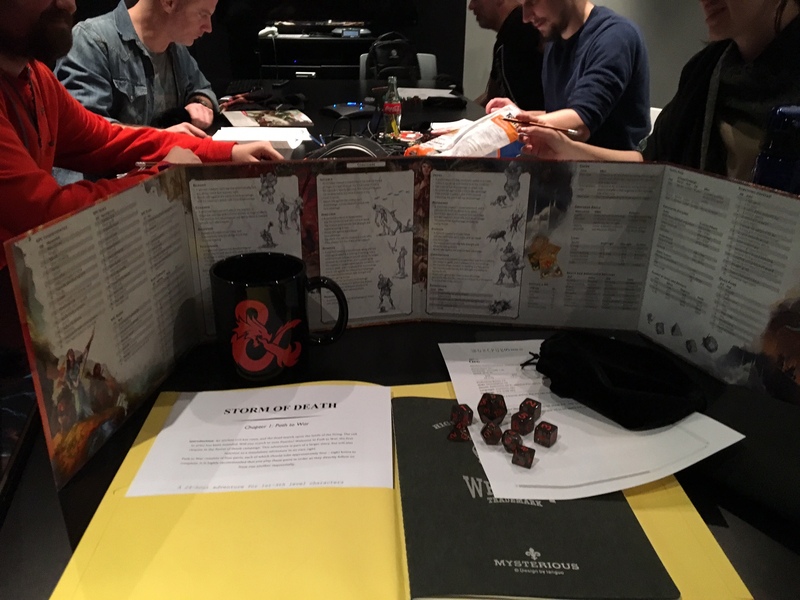 It was a great feeling to kick off the session by handing out cool t-shirts, note pads, custom dice with branded bags, stickers, and a whole bunch of other stuff. It really got everyone pumped for playing D&D, so thank you Greg and everyone else at Wizards for being awesome. The adventure began with our party travelling from the city of Waterdeep. They were travelling along the Evermoor Way, a famous trade route between the sword coast and Silverymoon, the capital of the Silver Marches. The characters joined the supply convoy of a Dwarf named, Belbrek. He was a stubborn old Dwarf who made sure everyone travelling with him contributed to the journey. Some characters acted as scouts, advancing ahead of the convoy to check the road was safe. Others acted as escorts, staying alert and ready in case trouble came calling. Some just paid Belbrek a fee and relaxed in the back of some of the caravans. The convoy left Waterdeep early one morning, their objective was to take essential supplies and equipment to Silverymoon. Recently an undead army had marched west from the Anauroch Desert, and had laid waste to every settlement that crossed its path. The Silver Marches were under siege and had requested aid from the cities of the sword coast to help combat this threat. Belbrek’s caravan was one of many supply convoys heading east to answer the call of their besieged neighbors. The characters that scouted ahead came across an unusual sight. The road had been blockaded with thick logs bound together with crude leather straps. Fearing an ambush, they made haste back to the convoy to inform Belbrek of this development. When they returned, Belbrek took the news well. He was a seasoned travelling merchant, and had seen his fair share of trouble in the past. His mercenary guards, led by the Dragonkin, Bhazire, were ample protection against road bandits. He decided that they had to press on and clear the logs. There wasn’t another trade road heading east for many miles, so they were best facing the problem head on. With that, the convoy continued forwards. As the convoy reached the blockade, the party, with the help of the mercenary guards, began to move the logs so the vehicles could get past. As they worked, a pack of roaring Orcs, their faces painted white, charged out of the nearby trees and attacked the caravan. The party and mercenaries leaped to action, engaging the Orcs in combat. It didn’t take long for the characters to start cutting down the Orcs, but as their numbers thinned, they broke from combat and fled back into the trees. The party thought they had won a great victory, until they realized the attack was a diversion. The Orcs had kidnapped a number of the convoy’s travelers during the chaos of the encounter. With the mercenaries injured and the blockade still to move, Belbrek pleaded with the party to pursue the Orcs and rescue his people. The party agreed and set off, hot on the trail of the Orcs. After some time navigating through the dense trees, and avoiding primitive traps, the party found the Orc camp. They could make out the prisoners who were being held in iron cages, and several Orcs who guarded them, including a female Orc with an elaborate pair of blades, and red feathers in her hair. The heroes stealthily crept through the trees to position themselves all around the camp. They planned to perform an excellently coordinated ambush, taking out the four Orc lookouts simultaneously with precision bow shots. When the time came things didn’t go quite as planned. One Orc took two arrows to the knees, causing him to howl in pain and confusion. One Orc was lured to a tree and then shot through the neck by an Elf archer waiting in the canopy above. Another Orc took a crossbow bolt to the bicep which confused him no end. The last Orc was half asleep when he heard a whistling sound past his ear. He turned to see who was there, but in actual fact it had just been an arrow that missed it’s mark sailing past. With the Orcs fully alerted to danger they formed up in the center of their camp around their large fire pit. They spotted several of the characters and charged into action. Combat was quick and brutal. Several Orcs were peppered by magical attacks which angered them and saw three brutes charge a lone mage who had to use all of his concentration to keep his magical shield intact whilst the Orcs battered against it. Several Orcs pursued a Halfling rogue, but they just couldn’t hit him much to their frustration. A stout Dwarf fighter found the Orcs leader on the field of battle and brought his pick and flail to bear and smashed her to the ground after taking several blows from her wicked blades. With the leader defeated the other Orcs fell quickly. The last Orc was dragged by the Elf ranger towards the fire pit, and then kicked into the flames by a very bloody and bruised mage. The heroes rescued the captives and returned to the convoy victorious. Belbrek was thrilled to see them all alive and well. He was concerned about what the road ahead might have in store, and so offered to pay the heroes a handsome 50 gold pieces each if they stayed on as extra protection for the rest of the journey. The party agreed and so travel was resumed. The next stop on the road was Red Larch, but you’ll have to come back in two weeks to find out what happens there.